Above: Memorial in Ashburton churchyard to some of the Yolland family. Some of it is difficult to read - probable inscription is in italics. 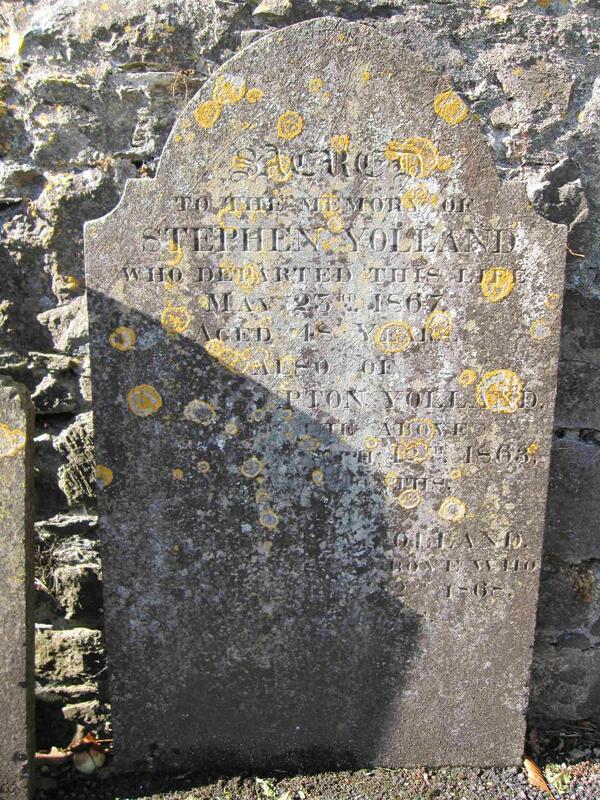 On October 1st 1818 two children, William and Stephen, were baptized, the sons of Stephen and Susanna Yolland. Stephen is a yeoman, and the couple live at Mead in the parish of Ashburton. 1842 Stephen Upton Yolland, aged 62, was buried March 11th. In 1861 Stephen Yolland, aged 42, a corn and seed dealer, was living with his 28 year old wife Sarah in East Street. 1862 Stephen Upton Yolland, the son of Stephen and Sarah, is baptized on June 17th. Stephen is described as a merchant. By 1869 Sarah, a widow, borrowed £24. 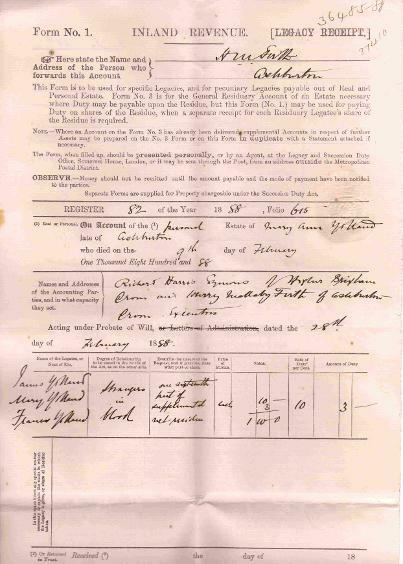 Dated 2nd July 1869, the bond (below) has the title: Mrs Sarah Yolland to Messrs George Wills Yolland and Charles Yolland, Bond for securing £24 and interest. Stephen Yolland, George Wills Yolland and Charles Yolland were all brothers. 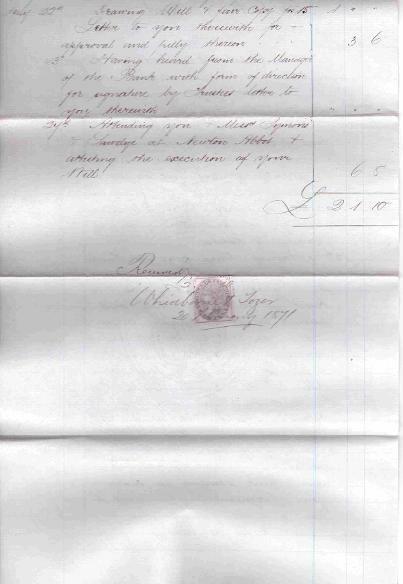 Right: An invoice sent by Mssrs Whidbourne and Tozer to Mr G W Yolland for work done in 1870. 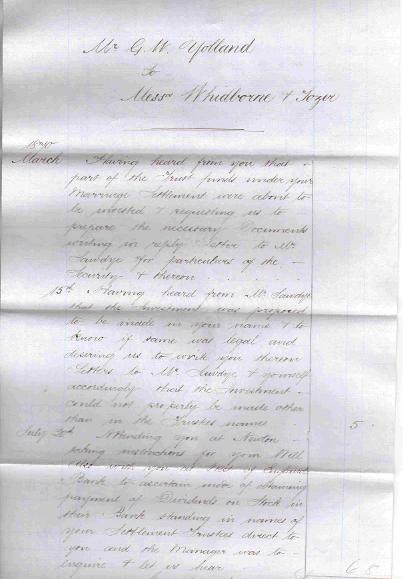 1870 March Having heard from you that part of the trust funds under your marriage settlement* were about to be invested and requesting us to prepare the necessary documents writing in reply Letter to Mr Sawdye for particulars of the security and thereon. 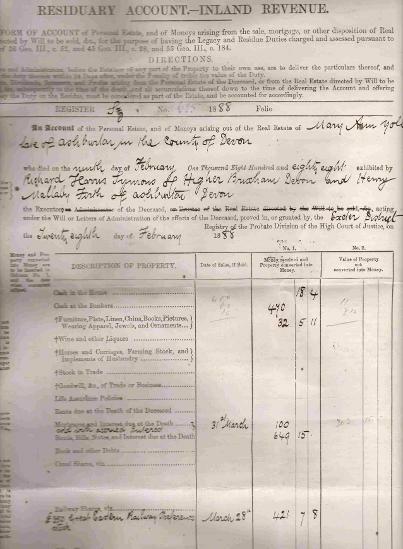 In the 1871 census George, a chemist and druggist, is living with his wife Mary Ann next door to James Yolland, tailor, and his wife Elizabeth. The two properties are between the New Bottle Inn and the Sun Inn in North Street. 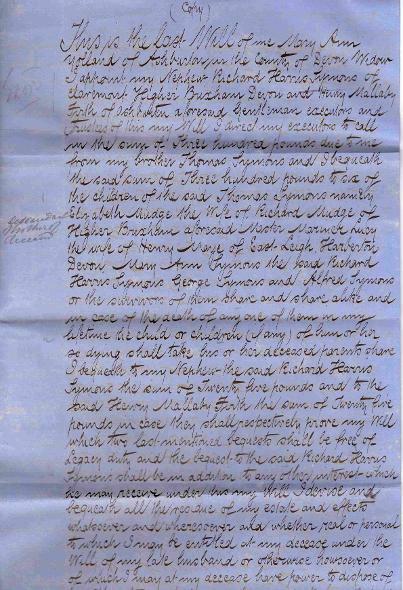 It reads: This is the last will of me Mary Ann Yolland of Ashburton in the county of Devon widow. Right: Two pages from an account made by the executors of Mary Ann Yolland for the Inland Revenue. Both these securities are valueless. Above and above right: One of the receipts for duty mentioned above. 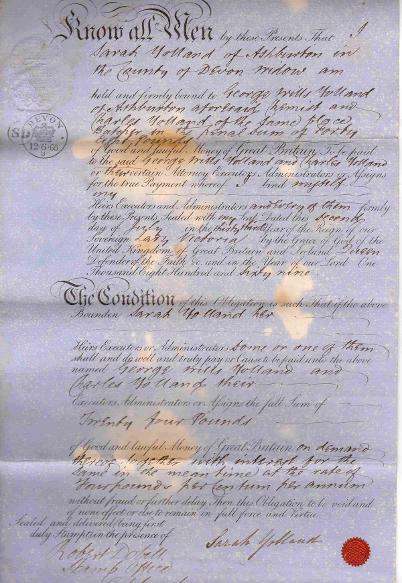 The bond (below left) reads: Know all men by these presents that I, Sarah Yolland of Ashburton in the County of Devon widow am held and firmly bound to George Wills Yolland of Ashburton aforesaid chemist and Charles Yolland of the same place butcher in the penal sum of forty eight pounds of good and lawful money of Great Britain. 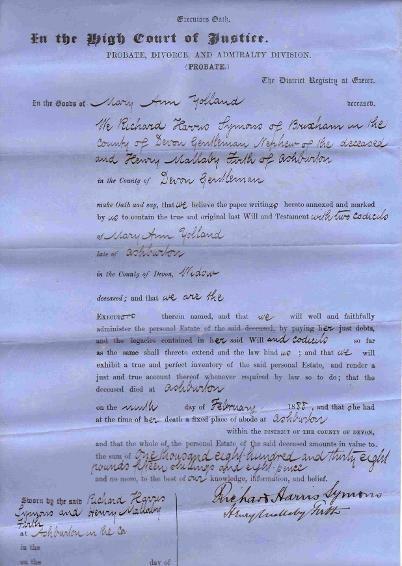 To be paid to the said George Wills Yolland and Charles Yolland or their certain attorney executors administrators or assigns for the true payment whereof I bind myself my heirs executors and administrators and every of them firmly by these presents sealed with my seal dated this second day of July in the thirty third year of the reign of our sovereign lady Victoria by the grace of God of the United Kingdom of Great Britain and Ireland Queen Defender of the Faith etc. and in the year of our Lord one thousand eight hundred and sixty nine. The condition of this obligation is such that if the above bounden Sarah Yolland her heirs executors administrators some or one of them shall and do well and truly pay or cause to be paid unto the above named George Wills Yolland and Charles Yolland their heirs executors administrators or assigns the full sum of twenty four pounds of good and lawful money of Great Britain on demand thereof, together with interest for the same in the meantime at the rate of four pounds per centum per annum without fraud or further delay then this obligation to be void and of none effect or else to remain in full force and virtue. Sealed and delivered (being first duly stampt) in the presence of Robert Dobell stamp office Ashburton. 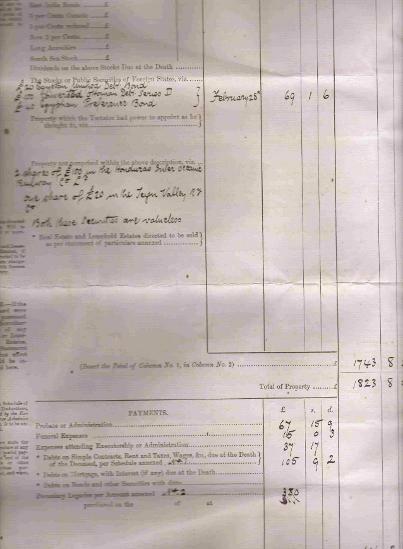 Left: A list of documents connected with the 'settlement' (presumably the marriage settlement) of Mr and Mrs G W Yolland. 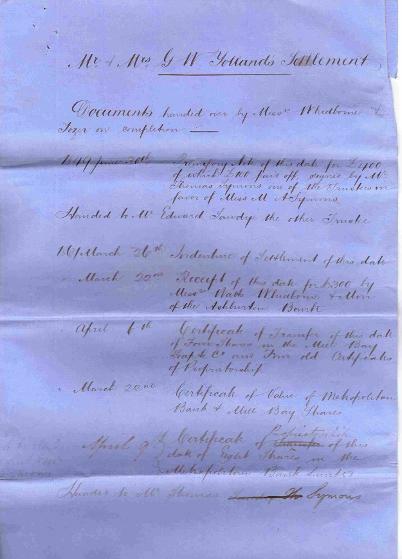 The list is undated, but refers to documents in 1849 and 1867. Documents handed over by Messrs Whidbourne and Tozer on completion. Left: 'In the matter of the Companies' Acts 1862 and 1867 and in the matter of the West of England and South Wales District Bank'. 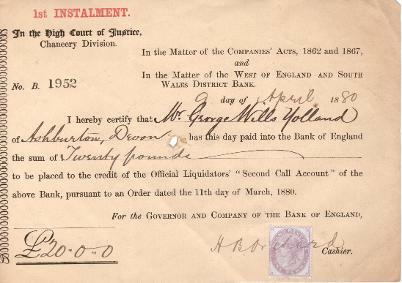 A receipt dated 9 April 1880, certifying that Mr George Wills Yolland had paid £20 into the Bank of England, 'to be placed to the credit of the Official Liquidators' "Second Call Account". In the 19th century shareholders often had some liability should the company that they were investing in fail. Two months before the West of England and South Wales District Bank had sought to wind up Thomas W Booker and Company Ltd., as they were unsecured creditors of £20,000 upwards. Failures of companies such as Thomas W Booker must surely have contributed to the demise of the bank itself. Below left: An executors' oath made at the district registry at Exeter. We Richard Harris Symons of Brixham in the couonty of Devon gentleman nephew of the deceased and Henry Mallaby Firth of Ashburton in the county of Devon gentleman make oath that we believe the paper writings hereto annexed and marked by us to contain the true and original last Will and Testament with two codicils of Mary Ann Yolland late of Ashburton in the county of Devon widow deceased; and that we are the executors therein named, and that we will well and faithfully administer the personal estate of the said deceased, by paying her just debts, and the legacies contained in her said Will and codicils so far as the same shall thereto extend and the law bind us; and that we will exhibit a true and perfect inventory of the said personal Estate, and render a just and true account thereof whenever required by law so to do; that the deceased died at Ashburton on the ninth day of February 1888, and that she had at the time of her death a fixed place of abode at Ashburton within the district of the county of Devon, and that the whole of the personal Estate of the said deceased amounts in value to the sum of one thousand eight hundred nad thirty eight pounds fifteen shillings and eight pence and no more, to the best of our knowledge, information and belief. On page 3 of the account there is a note: When the residuary account has been passed separate legacy receipts shall be prepared and signed by the sixteen residuary legatees who will pay their respective duties according to their degrees of relationship to deceased. 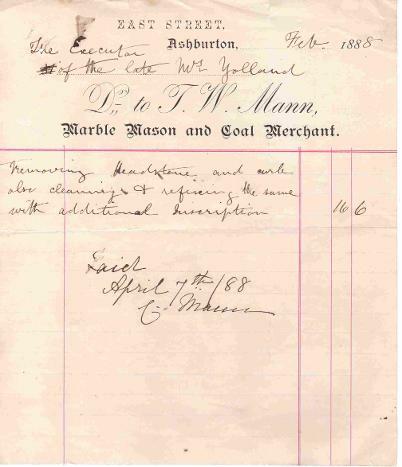 Left: A receipted bill from J W Mann, Marble mason and Coal Merchant of East Street, Ashburton. Dated February 1888, it is addressed to the executors of the late Mrs Yolland, and is for 'Removing headstone and curb, also cleaning and refinishing (?) the same with additional inscription'. The cost was 16s 6d. 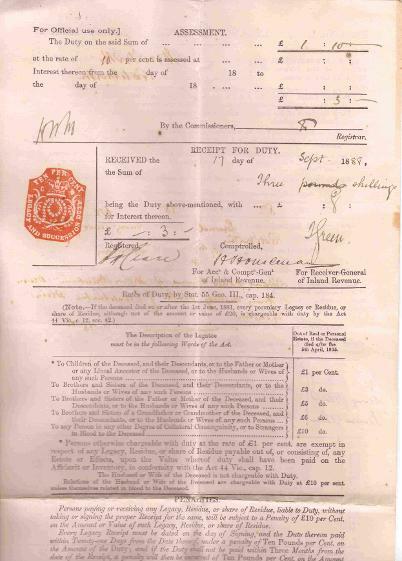 The receipt states that James Yolland, Mary Yolland and Frances Yolland all received 'one sixteenth part of supplemental net residue'. They are all stated to be 'Strangers in blood', ie not blood relatives.